Standard shall be deemed to impair the right of the Master of conditions are very typical and occur regularly. Hence, the “rea- a ship to require a seafarer to perform any hours of work nec- sonable anticipation” component of this regulation is ignored. 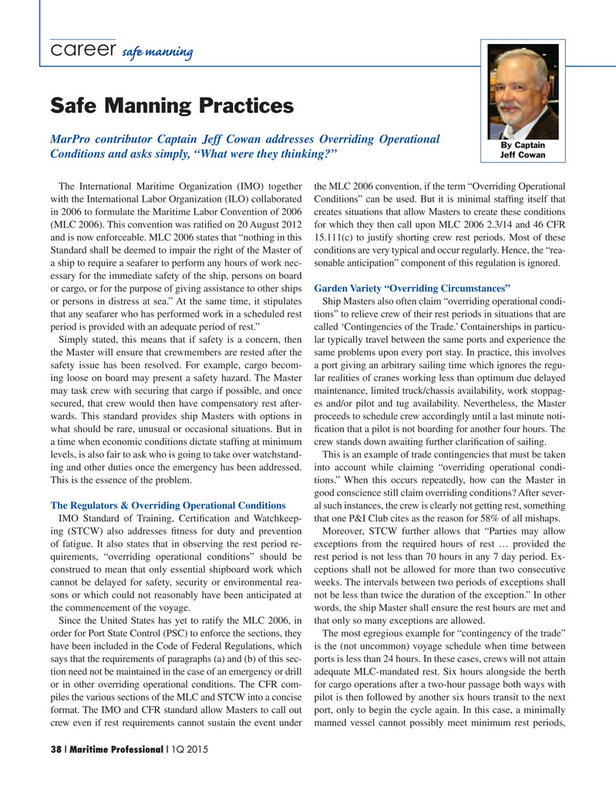 Simply stated, this means that if safety is a concern, then lar typically travel between the same ports and experience the the Master will ensure that crewmembers are rested after the same problems upon every port stay. In practice, this involves safety issue has been resolved. For example, cargo becom- a port giving an arbitrary sailing time which ignores the regu- ing loose on board may present a safety hazard. The Master lar realities of cranes working less than optimum due delayed may task crew with securing that cargo if possible, and once maintenance, limited truck/chassis availability, work stoppag- secured, that crew would then have compensatory rest after- es and/or pilot and tug availability. Nevertheless, the Master wards. This standard provides ship Masters with options in proceeds to schedule crew accordingly until a last minute noti- what should be rare, unusual or occasional situations. But in ? cation that a pilot is not boarding for another four hours. The a time when economic conditions dictate staf? ng at minimum crew stands down awaiting further clari? cation of sailing. IMO Standard of Training, Certi? cation and Watchkeep- that one P&I Club cites as the reason for 58% of all mishaps. Since the United States has yet to ratify the MLC 2006, in that only so many exceptions are allowed.